Holds a PhD in evolutionary ecology at the University of Burgundy, Dijon. My main research is to link behavioral ecology, immuno-ecology and molecular ecology to understand the origin and maintenance of genetic variability in natural populations. OBJECTIVE 1 – Assess and understand the neutral and adaptive genetic diversity – Numerous studies have shown that marmots had a relatively low genetic diversity, but the causes of this phenomenon are still unknown. 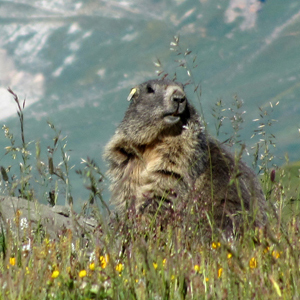 By using selected (MHC genes) and neutral genetic markers, I will assess and compare individual and population genetic caracteristics in marmots living in the Alps and in the Pyrenees. OBJECTIVE 2 – Determine genetic characteristics involved in mate choice – Mate choice is generally assumed to be involved in MHC genetic characteristics. Here we will look for genetic characteristics involved in mate choice in alpine marmots. OBJECTIVE 3 – Identify demographic factors and selective processes involved in genetic diversity – By using fossil and long-term data samples, we will be able to study changes in genetic diversity at different time scales, and thus to understand the role of demographic events in the current and past genetic diversity. By comparing the MHC diversity of populations exposed to different evolutionary histories and to different selection pressures (different levels of inbreeding and disease), we will try to understand how the selection pressures and demographic processes may impact the genetic characteristics studied. Bichet C., Ferrandiz-Rovira M., Cohas A. 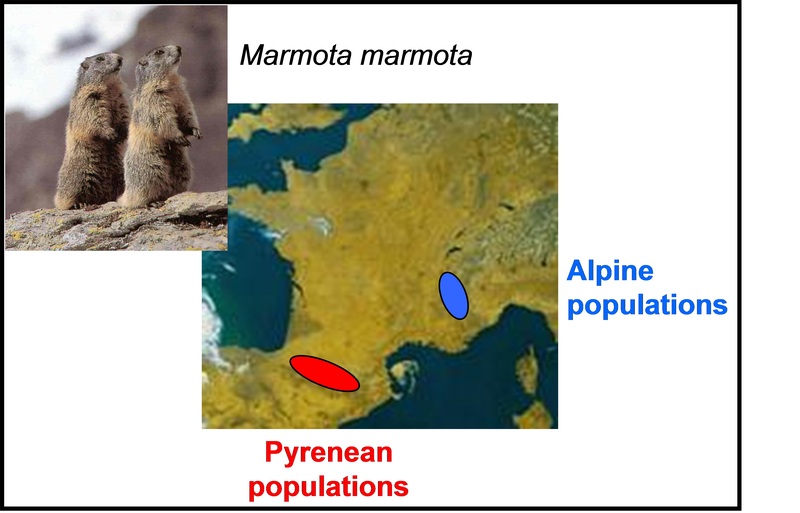 (2018) Multiple geographic origins and high genetic differentiation of the Alpine marmots reintroduced in the Pyrenees. Functional Ecology Conference, Nancy, France. pdf. Bichet C., Allainé D., Sauzet S., Cohas A. (2017) Direct and indirect effects of climate on extra-pair paternities in a population of Alpine marmots. European Society for Evolutionary Biology, 16th Congress, Groningen, The Netherlands.